Quit Wishin & Go Crusin in Alaska for a great day of Halibut Fishin! Join our experienced crew for a fun day of halibut or salmon fishing on the beautiful Kenai Peninsula. All tackle, bait and fish fileting provided. Park your RV or camp in a family owned campground that will present you with the most beautiful sunsets. We are the closest full service, secure park to downtown Denver and the Denver International Airport. Wilderness Pack Trips, Horse Rentals, Wagon Rides, Elk Hunting, Youth Camps, & Fishing in Northwestern Colorado. Permitted in White River National Forest & Flat Tops Wilderness. Beautiful scenery, peaceful...a great get-a-way by the river. World class adventures from the comfort of New England's premier outdoor adventure resort! Family Camping at the Jersey Cape! Swimming Lake * Fishing Lake, 3 Pools, Acitivities, Cabins, Groups, Packages, & Discounts! Come to where memories are made... Holly Shores is located midway between Wildwood and Cape May, minutes from the beaches in New Jersey. We have 38 wooded acres for fun and relaxation so bring the whole family - we are kid and dog friendly! 2017 Best of South Jersey: "Best camping on the cushy side". 2017 NJ.com "Best place to get your glamping on"
A friendly family campground with a great program of activities. Camping cabins available in North Carolina. Two are rustic, no facilities. Third has electricity. Each will sleep up to 5. Limited primitive riverside tent camping. Camp Wyandot is located in the beautiful Hocking Hills of Ohio. Camp Wyandot offers rustic cabins, fishing, hiking, canoeing, swimming and more CALL TODAY!!! "Mohican Canoe Livery & Fun Center" and "Mohican Campground & Cabins" have always been owned and operated by the same friendly faces; We are more than a canoe livery, campground, or fun center. Simply put we offer the best there is in Mohican Adventures. Beautiful scenery and close proximity to several of central Ohio's premier family vacation attractions compliment an already near perfect vacation destination. Large wooded sites, located in the scenic Poconos. Family camping among Amish Farms, close to Hershey Park, outlet malls, Valley Forge & Gettysburg. Experience all the excitement and attractions that Dallas has to offer at Destiny Dallas, where a beautiful, natural camping environment and a host of amenities combine to offer the ideal RV Travel experience. Welcome to Virginia, the Birthplace of America, for a camping experience that you will long remember. Virginia's gold medal winning state parks and great private campgrounds have teamed up to make camping here better than ever. The 850 acre Class VI facility overlooking the New River Gorge is an adventure-vacation destination offering a variety of camping, tent cabins, and rustic cabins, cottages with hot tubs and outdoor adventures. Vacation packages which include accommodations, meals at Smokey's On the Gorge and adventure activities at Class VI River Runners include kayaking, rock climbing, mountain biking, and horseback riding and fishing. Enjoy the trails which lead to Mill Creek or the National Park Service New River Gorge Canyon Rim visitor center and other area trails close by. Call now for packages or quotes. 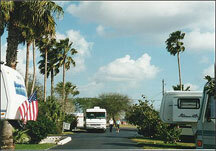 Full service Campground and individual Log Cabins with all the modern conveniences of a motel. Waterfront Cottage Colony & Waterfront Campground directly on the St. Lawrence overlooking the spectacular 1000 Islands. Rent or join our sea kayak tours to explore the island coastlines. Sailboat, motorboat & bicycle rentals.